The wild or native primrose, has been used and an indicator of ancient woods over 100 years old in Eastern England. A cheerful sight, the early flowering woodland perennial is long lasting and very easy to grow preferring partial shade, in deep humus rich, moist soil. From early to late spring, clusters of fragrant, usually pale yellow flowers form from a rosette of deeply veined, bright green leaves. Plants benefit from being lifted and divided every two years, anytime between autumn and early spring. Both the flowers and the leaves are edible, with a flavour said to range from mild lettuce to bitter salad greens. 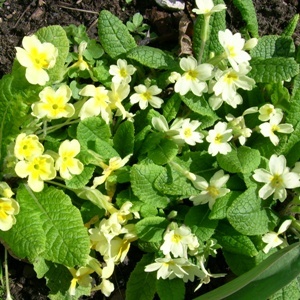 The leaves can also used for tea and the flowers made into primrose wine. Primula vulgaris is a superb early spring flower.